The 2014 Ducati Streetfighter for Sale by Owner was my dad's and I'm helping him sell. The 2014 Ducati Streetfighter 848 is a rare model model and no longer being manufactured by Ducati. My dad kept this bike garaged all year long. it has been well taken care of with all maintenance performed by Ducati dealer and never dropped. The foam of the motorcycle's seat has been trimmed to provide a more comfortable seat height. and then buy this beauty that can take you wherever your heart desires. Most stock parts will be provided with the sale. The Streetfighter was occasionally ridden once every 2-3 weeks to keep it in good condition. Accepted payment is CASH in hand! No trades! 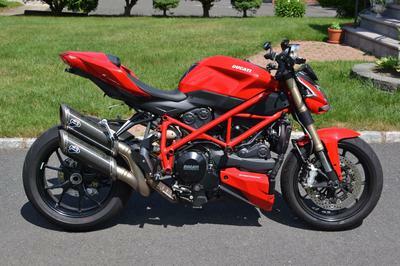 Please email me regarding the Ducati Streetfighter 848 for sale in this classified ad using the comment form below provided by GoGoCycles Used Motorcycles for Sale.